I have been looking forward to reading I Feel So Unnecessary, Adventures in Caregiving From a Granddaughter’s Perspective for quite some time. Lisa DuVal is a fellow caregiver and blogger and has a sense of humor that can always bring a smile to my face. Lisa offered me a complimentary copy of her book in exchange for my honest review and I jumped at the chance. No topic is off-limits for Lisa so I was very excited to hear she had written a book about her experiences caring for her grandmother. I quickly learned where Lisa got her bold and unabashed demeanor: Grandmother Cille was outspoken and opinionated – and apparently quite a caregiver herself. From frequently peppering conversations with the word “sh**” without hesitation to telling a nurse to “take him” referring to her husband, Cille is a fireball of a woman. Lisa shares vignettes of her caregiving days and does so in a way that made me adore both Cille and Lisa. This quick read of not only caregiving days but moments is also a testament to Lisa’s devotion to family and her positive attitude. Many of the situations Lisa dealt with when caring for her grandmother could have been much more stressful if Lisa hadn’t used her sense of humor to lighten the mood. So much of caregiving is about attitude and Lisa keeps a positive attitude and frequently sees the humor in her caregiving experience. 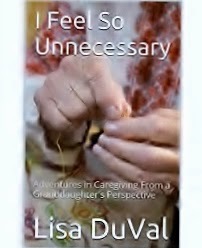 One of my favorite parts of I Feel So Unnecessary, Adventures in Caregiving From a Granddaughter’s Perspective is Lisa’s handling of a couple of situations with a home health aide and the agency. Lisa perfectly exemplifies a tough and persistent caregiving advocate in order to be sure her grandmother gets the quality of care that she deserves. You can purchase I Feel So Unnecessary, Adventures in Caregiving From a Granddaughter's Perspective on Amazon or through Lisa’s website, I Feel So Unnecessary. Thank you, Lisa, for sharing your caregiving experience and Cille with us.